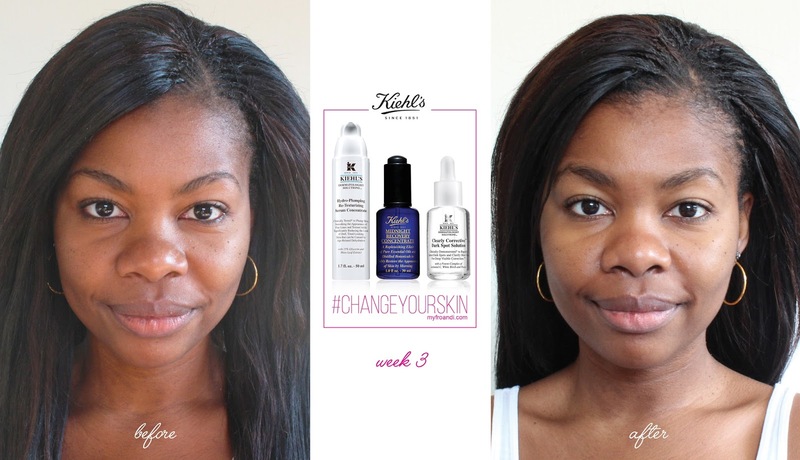 A few weeks ago, Kiehl’s and BeautyBulletin’s invited me to take on their #ChangeYourSkin challenge. The promise? Their super serums can change my skin in just 28 days. 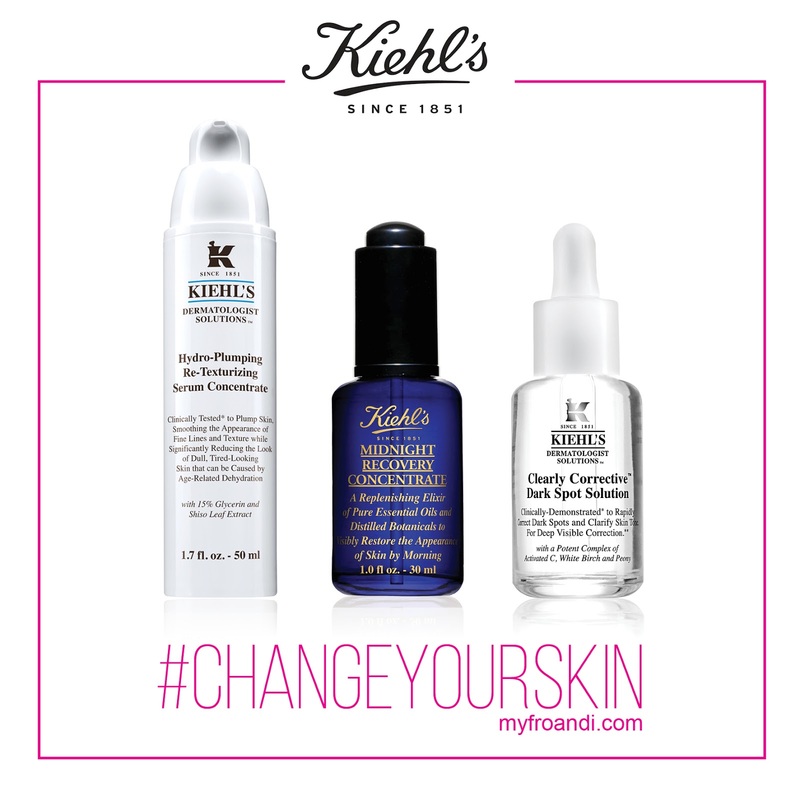 A bold promise but so far, Kiehl’s Midnight Recovery Concentrate (R665), Dermatologist Solutions Clearly Corrective Dark Sport Solution (R665) and Dermatologist Solutions Hydro-Plumping Re-Texturising Serum Concentrate (R675) are living up to their super serum nick name. To recap: Every morning, I first apply the Dermatologist Solutions Hydro-Plumping Re-Texturising Serum Concentrate followed by Dermatologist Solutions Clearly Corrective Dark Sport Solution. In the evenings, before I go to bed, I clean my face with my usual cleanser then apply Dermatologist Solutions Hydro-Plumping Re-Texturising Serum Concentrate followed by Dermatologist Solutions Clearly Corrective Dark Sport Solution and end the routine with Midnight Recovery Concentrate. For more details on each of these serums and their ingredients, click here. I see and feel the biggest difference in the mornings. My skin is hydrated, feeling soft and refreshed when I wake up. People at work have also been giving me compliments on how my skin is glowing. I’m still using the Hydro-Plumping Concentrate on my lips to help keep them moisturised and my lipstick is going on much smoother. I also think I’m starting to see a slight difference in the hyperpigmentation on my neck. I’m watching that area very closely so I’m hoping it’s not my imagination! Earlier last week, other beauty bloggers and myself had a live chat on Beauty Bulletin, where we and other ladies had the chance to chat to each other about our experiences with the products as well as ask Euphony Kgadima, Kiehl’s Head of Education, questions. She advised against using the Dark Spot Solution on lips as the skin in that area is different from the face. I have to admit I was really disappointed hearing that, as I was hoping to see a difference on my lips which have been a big concern for me over the years. She did however suggest I try a Kiehl’s lip balm with SPF. If you’re also concerned about your lip discolouration, watch this space as I’ll definitely be trying one of their balms out and will get back to you with thoughts. The Midnight Recovery Concentrate seemed to be everyone’s favourite, with an overall agreement that it helps us get a good night sleep. For highlights from a previous Kiehl’s chat, click here. Watch out for my forth (and final) update next week! I can also see a difference. Your face looks brighter and fresh/healthy (if that makes sense lol). It does and I feel fresher even morning too! I'm only wondering if it makes you glow or lightening your skin. hope it's not one of lightening cream. All the best. Lol no it's not lightening my skin. My after photo was taken at an earlier time in the day so the natural lighting was brighter that's all. I can see the change too. Your face is definatly glowing and there is change to your neck.Just one question are you using your normal facial cleancer, toner and moisturiser with these?